I am the custodian of a late 1951 Morris J Type van. This blog will document my J van research, and eventually the restoration of my van. I received a comment and an email from "Dr Keats" with a link to this terrific old TV advertisement for Buttercup bread, which must date back to the early '60s. The highlight is the delivery van. Enjoy! Buttercup must have had a reasonable fleet of J Types, and there's an Austin 101 listed on the J Type register as being ex-Buttercup Bakery. Dr Keats has uploaded a large number of other Australian TV ads from the good old days. Here's a link to his YouTube channel. Thanks for the tipoff Chris! Morris J Type vans and beer would seem to be a perfect pairing. Strangely J types don't seem to have been used very much by breweries, I guess they were a bit small for the heavy loads. 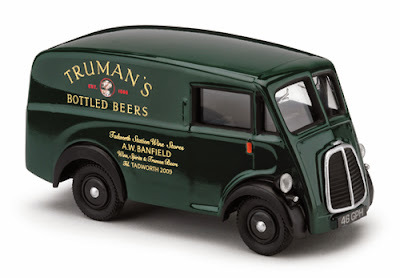 The Truman's van (what became of it?) was an example of a brewery J type and Carlsberg have one they use for promotional purposes. I would have thought a J Type would make a great promotional van for today's explosion of boutique breweries and I'd certainly make mine available for that purpose, just fill her up before you bring her back! I've always felt that it was a bit of a shame that we Morris restorers don't have a beer that we can call our own. The MG owners have their own beer "Old Speckled Hen" which was originally brewed for the 50th anniversary of MG. It has some obscure link to a canvas bodied MG which was speckled with paint or something. The MG octagon features on its logo. Its not a bad drop though! 100 years! I'll drink to that. 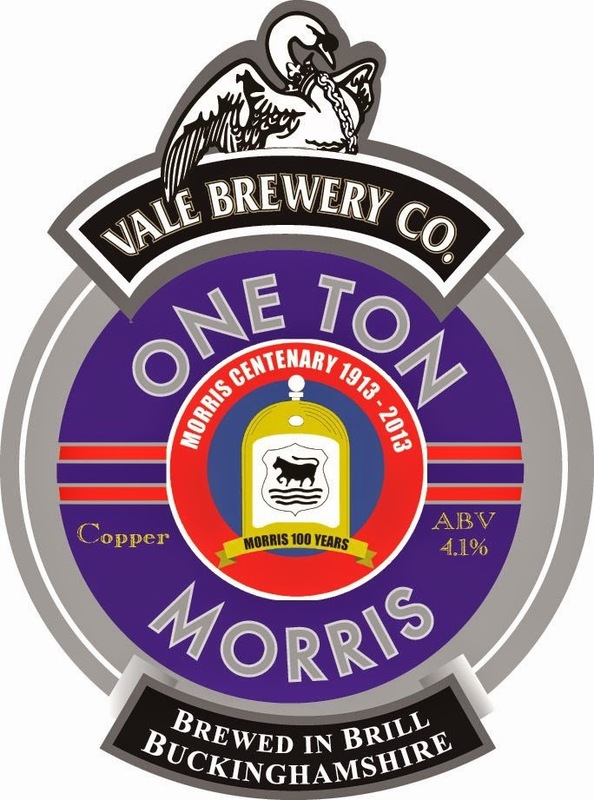 So I was pleased to discover that there is now a beer for Morris owners, in fact its a One Ton Morris so its actually a Morris Commercial. Apparently the British micro brewery, Vale Brewery Co. does custom labels and one off brews for people. This one was brewed for the recent 100th Anniversary of Morris celebrations. According to their Facebook page: "One hundred years ago the first Morris car rolled of the production line in Cowley, Oxford. To commemorate this we have teamed up with the Morris Owners club and used their logo on our pump badge. This 4.1% bitter is an all English affair with traditional floor malted barley and English hops. It is Copper coloured and we hope will become a favourite like the iconic car." It sounds pretty good to me. Just the thing after a busy day on the tools, or a long drive on a hot day. before, after or during restoration. The only problem with "One Ton Morris" is that the nearest pub serving it it 10,000 miles away, so I've had to come up with my own alternative. 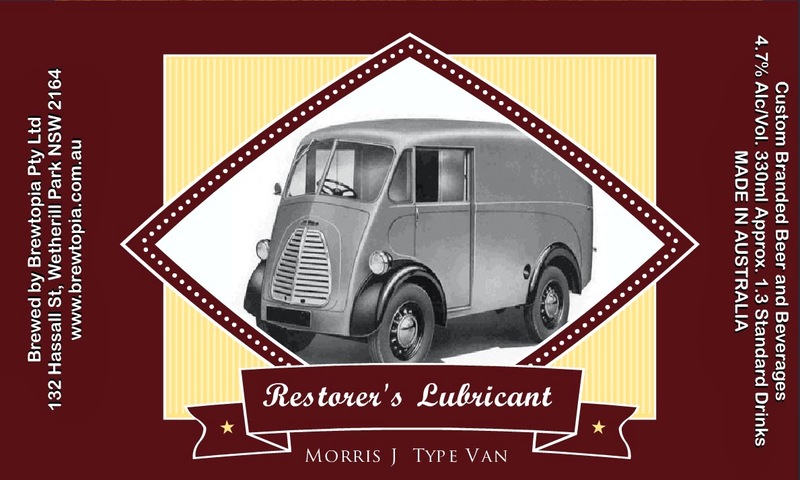 Presenting "Morris J Type Van - Restorers Lubricant". This is my own label of strictly limited release*. The beer is a Pale Ale, which according to the brewer falls between Kilkenny and Old Speckled Hen, in the beer flavour spectrum. I'll have to take their word for it, because the only case in existence has been freighted to J Van Hero, Kim, to thank him for the parts he gave me. The idea is to get some more, which can be used to pass on to other helpful and generous supporters as required. This label is a first cut and was designed on the little app on the suppliers website. I'm planning a more sophisticated design for future releases, drawn up in a proper software package and with better graphics. In the mean time, this one will do! If you'd like to design your own J van brew, have a look at Brewtopia. If you'd like a carton with my design, just email me and I'll order it and have it sent to you at cost, or in exchange for more of the precious missing parts! It sells for about the same price as premium beer, plus a moderate delivery charge. * strictly limited to the number I can sell/drink myself/give away. So What's in the Big Box? I know you're dying to see what was in my beautifully wrapped Christmas present. So here they are. The two biggest items are a radiator and a tailshaft. Neither of these parts would fit into my van after the original engine and gearbox was replaced with the 6 cylinder Holden grey motor, so they were discarded. The radiator will need a re-core, but that's to be expected in any restoration. I need to find someone good to do a mini radiator for me anyway, so it will be interesting to see how this one goes too. The drive shaft is a real ripper, I was actually pretty worried about finding one of these. I'm pretty certain they are unique to the J type. The Morris Oxford MO had a very similar one, but I doubt the length was the same. It might have been possible to get one made, but the unusual sliding joint would have been hard to replicate. This one looks crusty but will clean up fine. I expect the universal joints will need renewing, but I would anyway. The next priceless part is a handbrake lever and cables. Apparently you can't fit a grey motor into a J type and have a handbrake as well. The previous owner simply pulled it all out and through it away. Its interesting in that the handle seems to just bolt through the plywood floor, without any attachment to the chassis. I might have to see about that. The cables are the most complicated I've ever seen. There's no way you could have had a replacement pair made without a pattern to go off. These cables could almost be cleaned up and used, but I won't. If I can't track down a replacement set I'll use them as a pattern to try to get a pair made. Brey motors are two cylinders longer than sidevalve Morris engines, so they need to sit further forward at the front to fit them in. This means that the throttle linkage which goes from the pedal across the front of the engine to the carby, won't fit. The solution is to bend, cut and weld it. Luckily Kim could supply a replacement for that also. I should be able to mix and match it with the remains of mine to make one good one. And the final piece is the clutch pedal. I guess they decided that it was easier to use an automatic gearbox, and ditch the original chain actuated clutch, rather than try to rig up some hydraulics to operate a Holden clutch. Whatever, they threw away the pedal. Once again Kim came to the rescue with this beauty. It has a real sculptural look too it, and its in great condition. You could use it like it is. I reckon most of my readers will agree that these parts have a certain beauty to them. One thing for certain is that I owe a huge debt of gratitude to Kim for generously donating these almost irreplaceable parts. Why did he give them away? He explained that he doesn't plan to use these old J type parts. The vans he is going to restore are both JB vans that either use different (better) later parts, or these are parts that are surplus to his requirements. He reckons that he'd rather give them away to someone who can use them instead of just hoarding them. I think this is a very noble philosophy and hope that I can do the same for someone else one day. - I doubt I could persuade my wife though. tourer, a van and a nicely restored saloon he drives on his 100km round trip commute to work. He also has a big 4WD Bedford truck. Even more interesting to me are his five J and JB vans. Not all of them are saveable, but he reckons he should be able to build two good ones from the best parts of the five. At present he is building up the chassis of his first, a JB chassis, which has a 1662cc B series motor and gearbox from a Morris Major, and the diff internals from a Wolseley. It will be fitted under the body of an earlier J Type. Pictures of Kim's progress are on his restoration blog. Kim has a very pragmatic restoration philosophy. He wants to build a van that he can use on a regular basis. Hence the bigger engine and more practical diff ratio. His next step is a larger fuel tank, which will triple the fuel capacity. By using parts from within the BMC family, he can keep many of the improvements invisible. His ultimate aim is to fit the van out with period camping fittings so that he can travel in comfort and style. Maybe its his background in helicopter safety, but Kim is extremely particular about doing things properly. It looks to me like every bush, pin or wearing part is being brought back to perfect original standard. He has done things like having leaf springs made, kingpins re-bushed and spring carrier wedges cast and machined, rather than re-using worn parts. He showed me a handbrake quadrant that he'd built up with weld and then filed all the teeth by hand back to the original profile. As a result, all of the details look terrific. I hope I can do mine to a similar standard. After spending the afternoon looking over Kim's collection and lots of Morris talk, I met Kim's partner Bronwyn and son Rob and was treated to a great dinner. Then to top it all off, I was farewelled with an early Christmas present. Kim very generously donated a large number of the parts I am missing. I am extremely grateful for his generosity. Kim has officially earned the title of "J van Hero". That crate once held helicopter parts, but now it contains something much more important! Barry, my Father-In-Law is a big fan of Hornby O gauge model trains and often frequents swap meets and sales in the hope of picking up something new for his collection. This afternoon he dropped by with a very nice boxed set containing a Morris J Type along with a Bedford O type box van in early British Rail livery. The model looks to be pretty accurate and is nicely made. Its well outside my area of expertise, but apparently the set is a Corgi D46/1. Looking back through my previous posts I realise that there hasn't been much progress with my 1:1 scale van. However I'm off to Perth, Western Australia tomorrow, and I hope to have something interesting to report in a few days. Members of the Morris Commercial J Type Van forum and followers of Bugly's Blog have know for some time that Lou sold his van "Bugly" to be used in an advertising campaign. Although Bugly's new owners were a secret, various hints regarding chocolate and the colour purple let us all guess that Bugly's new life would be promoting Cadbury's chocolate. 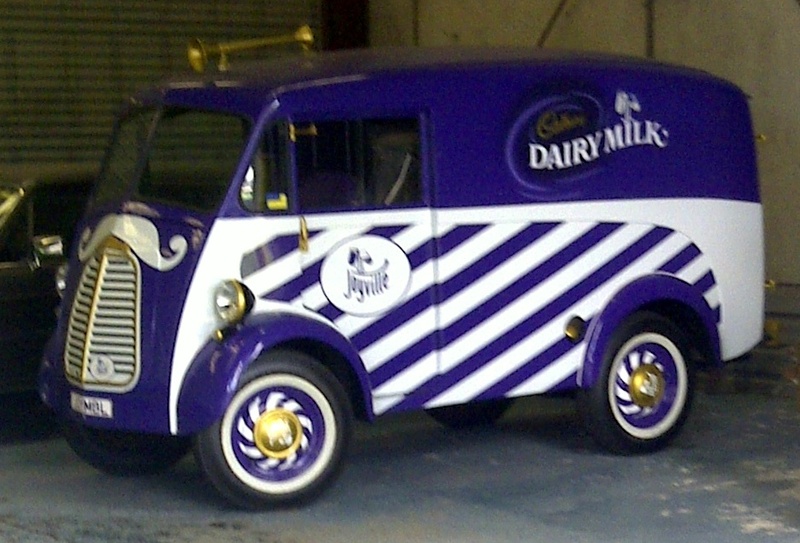 For some time Cadburys have been running their "Joyville" promotion where they use a range of different quirky vehicles, all painted in trademark purple, so a J Type seems a good choice. The new advertising campaign went to air in Australia last night, but as a viewer of ABC television I had to learn about it from the internet. Here's the youtube video. The promotion is called Joyville Special Delivery. It seems that there is a competition where they will deliver the winners a chocolate sculpture of something that gives them joy, personally they can keep the choccy and just leave the delivery van. There are already a number of mentions of the van (or is that vans?) on the internet. Cadbury's are calling it "The Joymobile". The work was done by Jade Auto Repair in Sydney. I have had my spies out today to have a stickybeak through the doorway of their workshop. Sure enough there's the Joymobile. Apparently the ad was filmed in NZ and the promotion seems to be running there too. But did they ship Bugly across and back just to film it, or is there another in NZ? Could there be more than one here? I found a mention on the internet that Jade Auto Repair did up "the vans", so there may be more. Are they doing the same promotion in the UK? Anyway, aside from the rather lurid colour scheme, its nice to see Bugly back on the road and even working, and the ad is going to bring more attention to the J type so that has to be a good thing. I was blessed with a visit from Peter Bateman yesterday. Peter is kind of J Type royalty in Australia, he's based in Sydney where he is owned by a shiny blue J Type known as "Mr Cholmondley". Peter is somewhat obsessed by J types, which I think is admirable. Peter was visiting Tasmania under the pretext of a birthday present for his wife, but somehow managed to fit in several visits with Tasmanian J type owners. Peter came by for a couple of hours and gave me the benefit of his many years of J Type experience. Unfortunately we really ran out of time, not helped by my two bored youngsters who spent the whole time interrupting and demanding snacks! She's not pretty is she? I find t helps to squint a bit and use my imagination. I particularly liked Peters suggestion of replacing all of the timber sub-structure with steel. Its something I'll be giving a great deal of thought to. The problem with the J type body is that its really just the top and two sides of a narrow box. The big opening for the rear doors doesn't have a strong stiffening frame around it so the body can literally flop from side to side, like a collapsing box. Its very common for them to go out of square and fatigue cracks in the corners of the roof are endemic. Adding a steel subframe under the floor would enable closing the 4th side of the box in steel, as well as providing a solid foundation for a proper stiffening structure around the rear door opening and at the front. I'm wondering whether I might be able to use it to add mounts for front seatbelts. I'm a bit paranoid about seatbelts, following a head-on in a Moke several years ago. Luckily Peter gave me three weeks warning that he was coming. The J type has been pushed into the corner of the shed and buried in household stuff since I brought it home. The rest of the shed was filthy and filled with junk. So I've spent the last three weeks having a massive clean-up and I rolled the van out so that Peter could have a proper look. This meant that I could take some pictures of the whole vehicle, rather than just bits of it. I also took the opportunity to try to get a panoramic photo of the fleet. These are my wheeled projects, there are any number of other unfinished jobs and unstarted projects still waiting. Since the big clean-up. it has been an absolute pleasure to get out into the clean and spacious workshop, but I do have to admit that the Mini has been the one getting the attention. Parts needed to convert from Holden grey motor and trimatic to the original SV and three speed. The History of the JB van HDU072. Hi, I live in Hobart,Tasmania, with my wife Carolyn and daughters Sarah and Adele. I work for the Australian Antarctic Division in fisheries science. I've been into classic British vehicles as long as I can remember, but mostly Minis and Mokes. I have a 1977 Leyland Moke, a 1961 Morris Mini Traveller. I also have a couple of bikes, a 1969 Triumph Trophy and a 1955 BSA C11G.